Here is a panorama shot with our Panono 360 during the 2017 Hansen Prize Competition. Grant Bauermeister, a runner-up for this year’s prize, is presenting in this image. 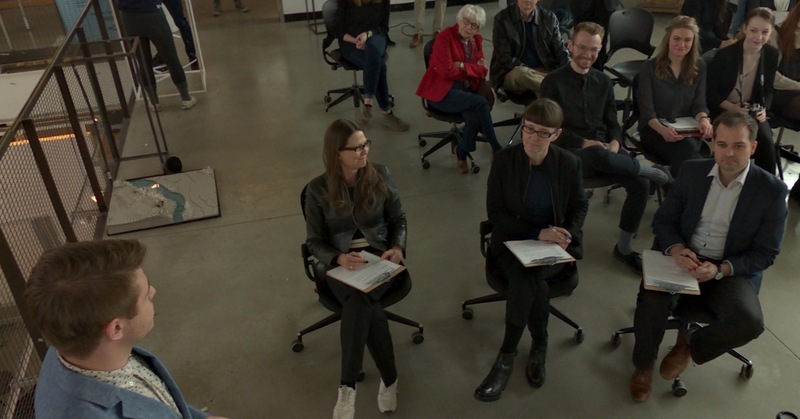 Jurors are (from left) Deborah Hauptmann (Chair of the Department of Architecture, College of Design), Felicity Scott (Columbia University, New York City), and Scott Steffes (SOM Chicago and ISU Alum). First prize went to Megan Zeien, and the other runner-up is Atalie Ruhnke.